Dwayne Michael Carter, Jr. (born September 27, 1982), better known by his stage name Lil Wayne, is an American rapper. At the age of nine, Lil Wayne joined Cash Money Records as the youngest member of the label, and half of the duo, The B.G. 'z, with B.G.. In 1997, Lil Wayne joined the group Hot Boys, which also included rappers Juvenile, B.G., and Turk. Hot Boys debuted with Get It How U Live! that year. Lil Wayne gained most of his success with the group's major selling album Guerrilla Warfare, released in 1999. Also in 1999, Lil Wayne released his Platinum debut album Tha Block Is Hot, selling over one million copies in the U.S. 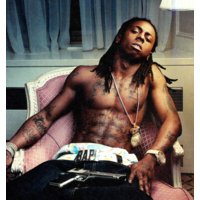 Although his next two albums Lights Out (2000) and 500 Degreez (2002) were not as successful (only reaching Gold status), Lil Wayne reached higher popularity in 2004 with Tha Carter, which included the single "Go D.J." Wayne also appeared on the Destiny's Child top ten single "Soldier" that year. In 2005, the sequel to Tha Carter, Tha Carter II, was released. In 2006 and 2007, Lil Wayne released several mixtapes and appeared on several popular rap and R&B singles. His most successful album, Tha Carter III, was released in 2008 which went on to sell over 1 million copies in the U.S. its first week of release. It included the number-one single "Lollipop" and won the Grammy Award for Best Rap Album. Lil Wayne released his debut rock album, Rebirth, in 2010 to primarily negative reception from critics. The album eventually went gold. In March 2010, Lil Wayne began serving an 8 month prison sentence in New York after being convicted of criminal possession of a weapon stemming from an incident in July 2007. While in jail he released another album entitled I Am Not a Human Being in September 2010, featuring Young Money artists such as Drake, Nicki Minaj and Lil Twist.